And like a Corolla, this club will get you from point A to point B. It is designed for higher handicappers and thus is very forgiving. The club face is adjustable to 8 different positions, but keep in mind the neutral position is actually a little closed. This is to help slicers. If you still slice it after trying it neutral, you obviously will need to tweak it even more closed. Now for the panning… Fasten your seatbelts. 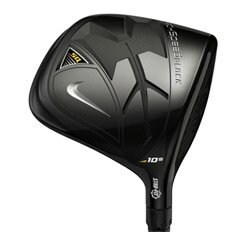 The square black driver head looks like a giant Klondike bar. (Mmmmm, yummy.) The only thing less pleasing than the look is the sound of the ball at impact. When I hear it, I imagine that I am a P.O.W. and the enemy is trying to extract information from me by making me listen to the Commandant hitting drives with this beast. TINK... TINK... TINK... "Ve have vays of making you talk..."
I recommend you upgrade to the Nike VR Pro. Buy last year's model if price is an issue. The club is much better looking, and it has 32 different adjustments. The sound still is a bit metallic, but it won't lead you to commit treason.